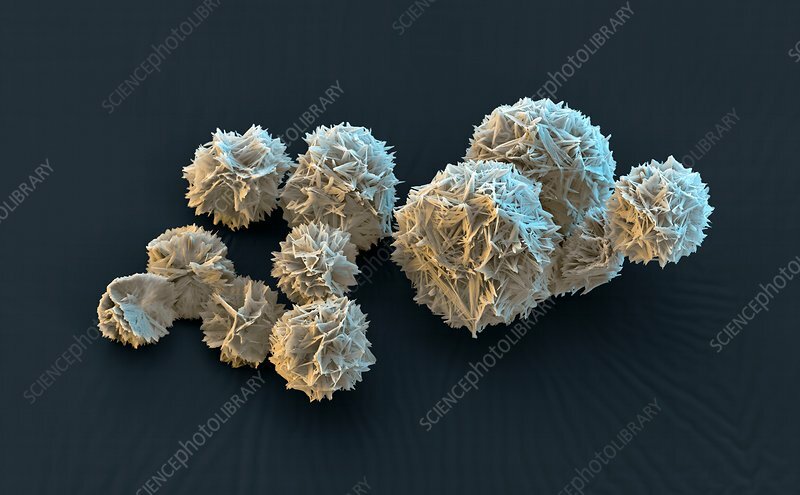 Polyvinylpyrrolidone (PVP), coloured scanning electron micrograph (SEM). As PVP is completely safe for human consumption, it is used as a binder in pharmaceutical tablets and as a food stabiliser (E number E1201). Also, during the Second World War and the Korean war it was used to dilute blood plasma, which could be administered to more victims who had lost blood and hence save more lives. This new ball form, patented by BASF, dissolves in water much quicker and hence extends it range of uses. Magnification: x150 when printed 10 centimetres wide.